The agenda for the weekend was to empty out an old boiler room. Because my goal is to blast Zeta to bare metal as soon as I have stripped it down and therefore I will be needing a warm room where to weld all Zetas seams before base coating, I volunteered to help my friends empty their old boiler room as they built a power plant to replace it. 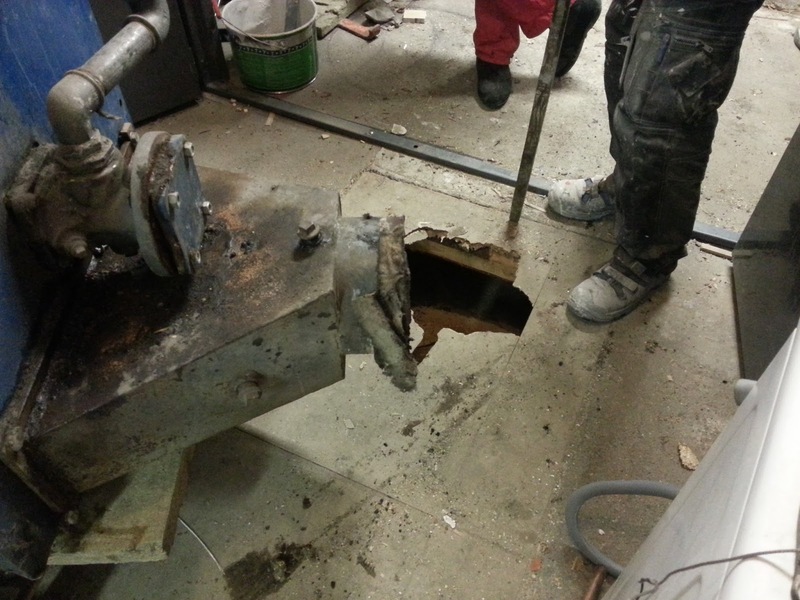 This warm room should be extremely useful in preventing rust because of the damp and warm winter we are experiencing in Finland. My friends got their new power plant up and running just in time for the winter and the old room was going to be a workroom from there on out so I asked if I could bring my project at their place during the welding and base coating phase. The room is located in an old stone barn with my friends carpenter's workshop (Retulansaaren Puusepät Oy) and the room is just large enough to fit Zeta in (or so my measurements told me). Here is the starting point. 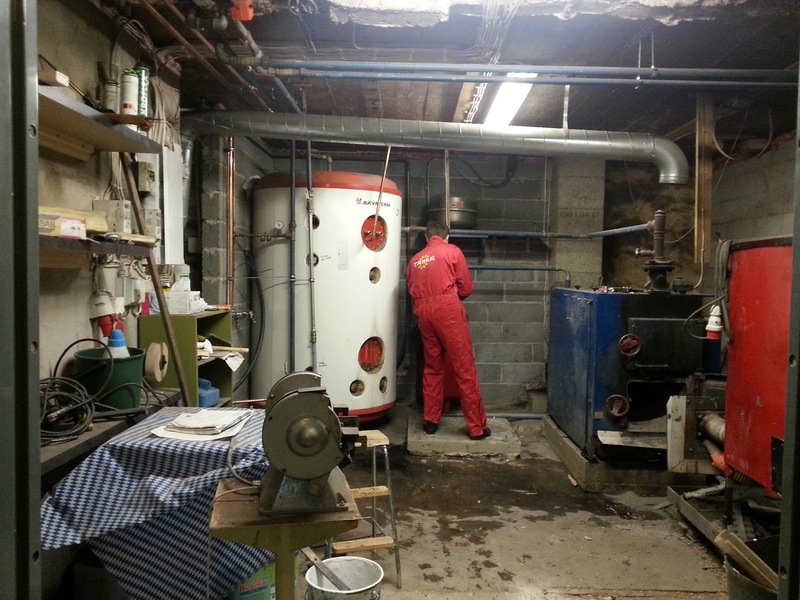 In the room we had one hot water tank (about one cubic meter in size), boiler and wood chip tank. There was also an industrial size washing machine, but that got thrown out first. 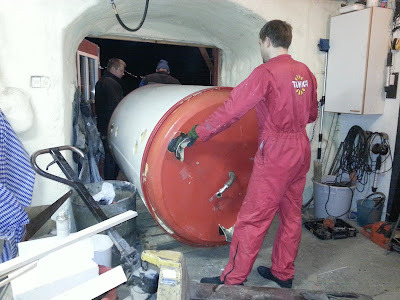 Second to go was the hot water tank, but only after we had cannibalized it for all useful items. Fortunately my friends had thought things through and they had emptied the tank beforehand! 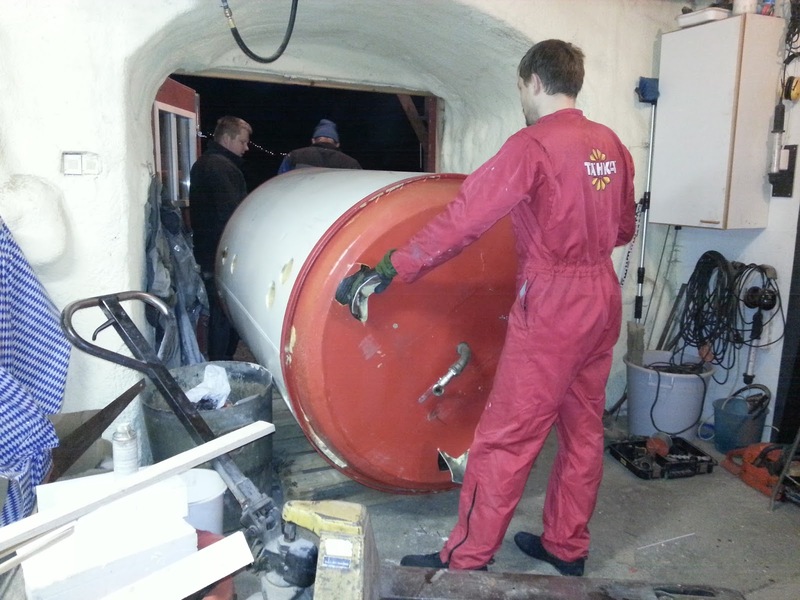 After the tank, we moved on to the boiler. Apparently there is not many things in world that can not be moved with brute force and pump trolley. It must be said that the move took four guys and equally as many breaker bars and a few sledge hammers, but we got it moving. A small additional excitement was aroused when no one remembered the covered manure shoots that lay on our way. 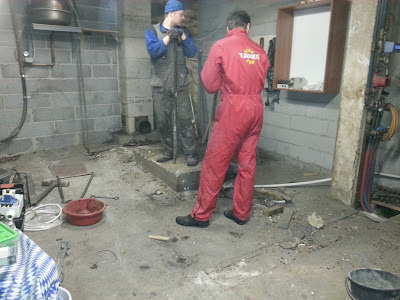 The end results can be seen from the picture, a big hole in the floor and the flooring in bad shape. On the next day we moved out the last item aka he wood chip tank. This way we had a good and reasonably large room for my Zeta and a room where I could weld and do the body work. Additionally there is a roof fan that is connected to an air outlet in the roof. This helps in keeping the welding fumes in bay. The foundation, that can be seen in the picture, will be "exploded" with an expandable chemical, because it is so hard that our tools did not even chip it. The rooms measurements are about 460 cm x 460 cm. As Zeta is about 440 cm with bumbers, the room is a bit tight, but fortunately Zeta shortens when it is stripped. For moving the stripped shell and for turning it to the right positions, I will be building a spit (rotisserie). I am making the plans and iterating them for countless times, but when they are ready I will post them in an separate article. And so was the weekend over, but fortunately I got to go to our cabin in a really good company. 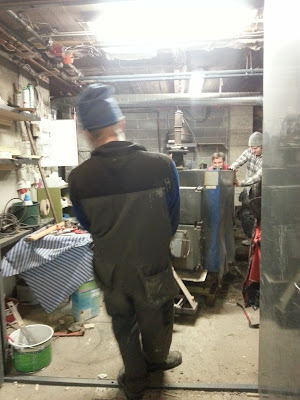 I'd like to thank my friends and company Retulansaaren Puusepät for providing the workroom!